William Shatner loves deep-fried turkey, but over many Thanksgivings and Christmases he’s made mistakes, burned himself, and nearly burned down his house. 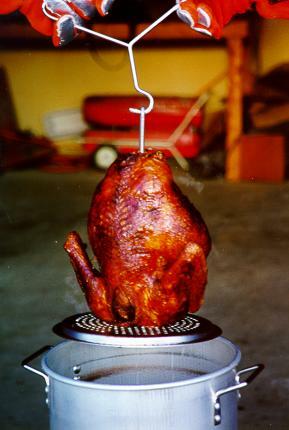 In this dramatic retelling, Bill shows us how dangerous turkey fryers can be. Eat, Fry, Love on YouTube. They’re inviting everyone to share their deep-fried turkey tales on YouTube and on Twitter with the #ShatnerFryersClub hashtag. I suspect the most dangerous thing I’ll attempt this holiday is egg nog.3 But the only thing that’s in danger of exploding is my language should I drink too much of it. I hope everyone has a fun and safe holiday and for those DC-area fed workers, let’s all cross our fingers for early release today! 1 I may be a little sketchy on the core concept of the holiday. 2 Or ‘Good Eats‘ on Food Network. 3 Slightly uncooked eggs… THE HORROR! !